Almost all the Syrians who fled from an army offensive towards a border crossing with Jordan have now returned to their homes, a top UN official says. Anders Pedersen, the UN humanitarian co-ordinator in Jordan, said that "around 150 to 200 people [are] right now at the border". 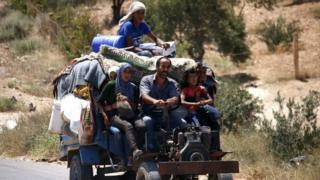 Up to 40,000 had massed near the Nassib-Jaber crossing - part of 320,000 to flee in recent weeks, the UN says. Many are now returning after a recent deal between the army and rebels. The provinces of Deraa and Quneitra had been relatively calm for almost a year because of a "de-escalation" agreement brokered by the US and Jordan, which support the opposition, and Russia, a key ally of the government Syrian President Bashar al-Assad. However, Mr Assad set his sights on retaking them after defeating rebels in the Eastern Ghouta region outside the capital Damascus in April. UN war crimes investigators have accused Syria and Russia of systematically bombing medical facilities, which are protected under international law, and intentionally attacking medical personnel, most recently in the Eastern Ghouta. Both Damascus and Moscow have repeatedly denied the accusations. Correction 9 July 2018: This story has been amended to make clear that Anders Pedersen was referring to those people who had fled towards a border crossing, rather than all those who had fled towards the border as a whole.